Companion planting is the practice of growing different plants near each other in a garden to improve their growth and vigor. The actual efficacy of this method of planting is unclear; much of the literature on companion planting is based on anecdotal rather than scientific evidence. Using a bit of research and creativity, gardeners who disperse flowers into their vegetable gardens may find that they assist pest control to the garden. Flowers can repel pest insects and attract beneficial insects. 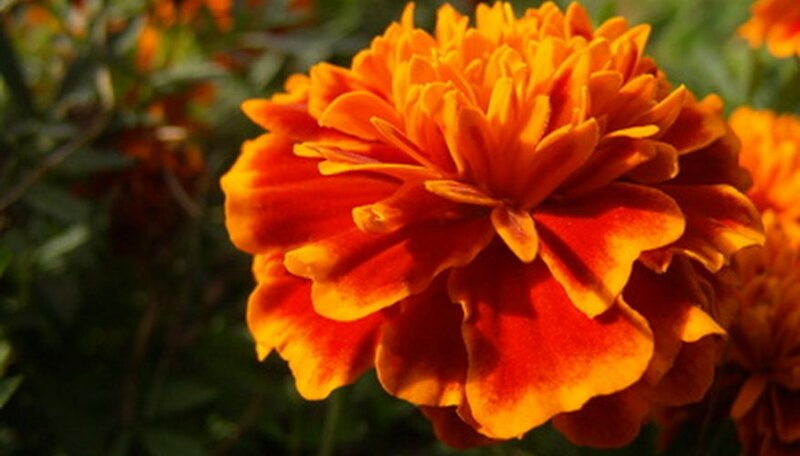 One of the most common companion flowers in the garden is the ubiquitous marigold, sometimes called the “workhorse” companion plant of the garden. Certain vegetables, when placed near each other, are said to improve each other’s growth and flavor, and common combinations include basil and tomatoes, peas and lettuce, and corn, squash and beans. The “three sisters” method of interplanting corn, squash and beans is one of the earliest known examples of companion planting, long used by American Indians. The corn acts as a growing trellis for the beans, which in turn provide nutrients to the corn through their nitrogen-fixing properties. Squash or pumpkin planted beneath acts as a natural mulch by shading the ground, and the large, rustling leaves deter animals such as raccoons from raiding the young corn. Flowers interspersed in the vegetable garden are primarily beneficial for their attractiveness to beneficial insects, such as ladybugs, lacewings, parasitic wasps and other predatory insects. Aromatic herbs, including basil, lovage, bee balm and anise hyssop, not only produce insect-attracting blossoms but are also useful for seasonings and tea. Certain types of flowers are also known for their repellent qualities to soil-borne pests, such as nematodes. Yarrow in the vegetable garden not only makes a lovely border plant, but attracts hover flies, ladybugs and beneficial wasps that prey on pests like aphids and hornworms. This plant is also said to repel certain pest bugs, and reportedly increases aromatic oils in herbs when planted in close proximity to them. Rosemary is another perennial plant that is purported to repel carrot flies. Bee balm is not only an attractive garden flower and tasty tea ingredient but is said to improve the vigor and flavor of tomatoes. Nasturtium is said to repel squash bug, and tomatoes also seem to do better in the presence of nasturtium. An added benefit of this plant is that its leaves, flowers and seed pods are edible. Sweet alyssum planted beneath broccoli helps prevent weeds from growing but also attracts beneficials such as parasitic wasps, pirate bugs and predaceous beetles. Dahlias and marigolds repel root nematodes, but marigolds are also said to deter all sorts of bugs, including beetles and tomato hornworms. The strong scent of the flowers may be confusing to pests looking for a specific target in the garden. What Vegetables Grow Good Together?